Another week – another pirate. That’s not a saying, but it should be. Today I was in a restaurant and saw a child rejoicing in his summer vacation. I miss those days, and not just because my time for painting seems to be diminishing by the hour. In the next five weeks I need to: travel for work – twice, take on a new project, start packing, close on my new place, gather a few thousand dollars for said closing, attend a wedding in another time zone, unpack, and move in. Needless to say, I do not expect to do much painting until mid-July. The rest of you had fewer excuses. 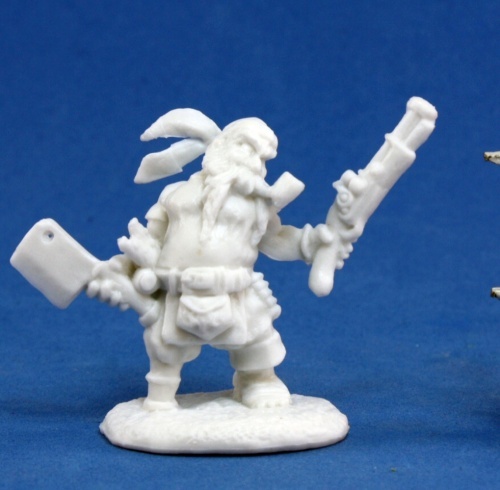 David B nails swarthy with his version of a dwarven pirate. Also – I don’t think the crazy eyes are an accident. Brewster went with a very clean and nondescript finish on this one. He looks almost TOO bright eyed and bushy tailed.. I wonder what is in that pipe he’s smoking. Arjen prefers fantasy models, sans guns, so he chopped it off and replaced it with a fish. As he says, you can always use more townspeople. 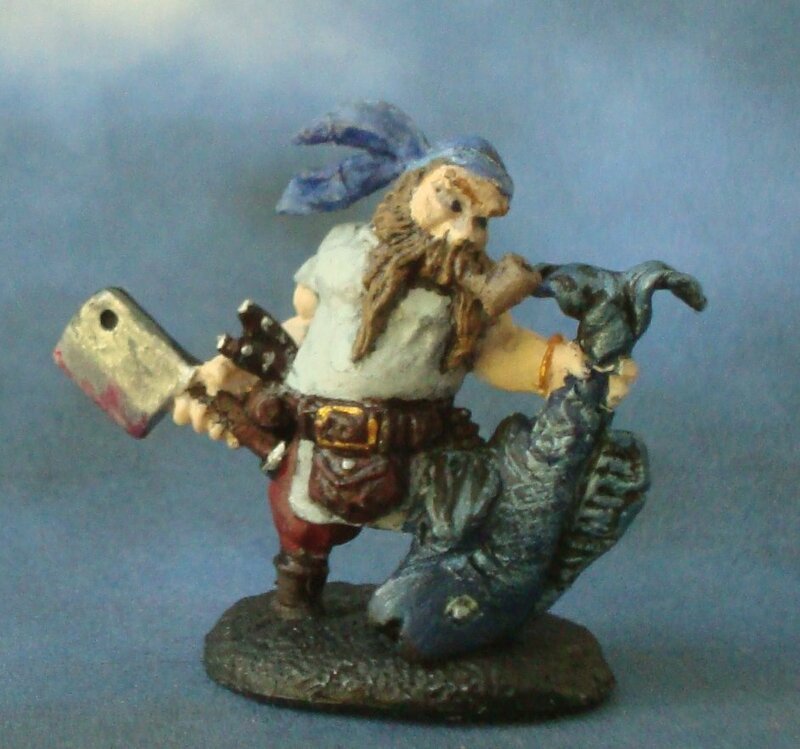 How right he is – a dwarven fishmonger would definitely make for a unique NPC. 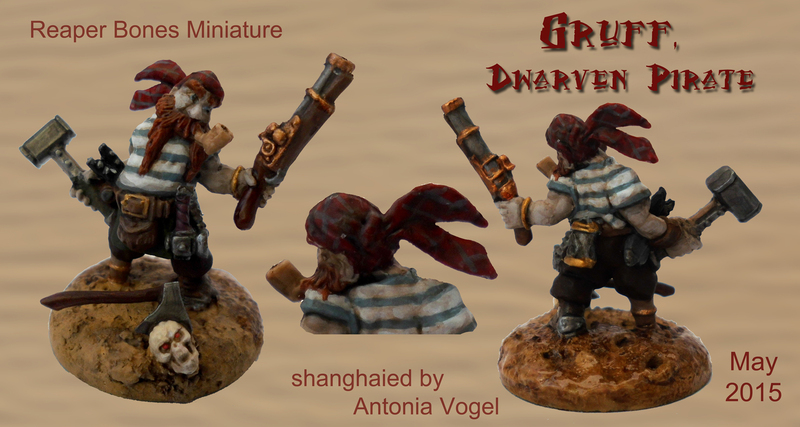 Antonia painted the most friendly and amiable looking of our dwarven pirates. I know – I’m scared too. The touches and little details are nice across the board as always, but its the stripped shirt that really brings this one out for me. Arrrh! What a fine collection of pirates. I especially like Arjens conversion, did you sculpt the fish yourself? It’s great… and big! Quite a catch! But a good work from all of you. Dave B and myself ended up with a VERY similar colour palette. Funny how that works. I was thinking about making a filthy shirt, but wasn’t too sure how to pull it off. It looks less filthy than intentionally khaki. I’m very impressed with the fish conversion. What a lovely idea and well executed. Antonia does do a great striped shirt. I quite like the axe in the skull (I think i’d have gone for black sockets myself). I’d like to complement the black knives with silver nubs, looks very much like a modern chefs knife. Well done all! Love the striped shirt, nice even stripes, always difficult. The fish is sculpted from greenstuff and sculpting big things is easier, so it is BIG.It makes the dwarf look smaller, so I think it works well this way. I have a question for the group. I actually completed my Novacrop Sgt. a while ago, Is it still o.k. to submit him for Monday? Submit him now. I’ll be making the post tonight. I’ve been traveling. Oh, wow, thanks. I’ve been away myself and didn’t look at the dates, just the next name on the list.